Protein phosphorylation and dephosphorylation play important signaling roles in plant response to environmental stimuli. Extensive recent research in yeast and animals demonstrated that mitogen-activated protein kinase (MAPK) cascades are major pathways that transduce extracellular stimuli, including various stresses, into cellular responses. MAPK is activated by dual phosphorylation of threonine and tyrosine residues in a TXY motif located between subdomains VII and VIII of the kinase catalytic domain by MAPK kinase (MAPKK). MAPKK is, in turn, activated by MAPKK kinase (MAPKKK). Multiple MAPK cascades that carry out different functions are present in a single cell. SIPK and WIPK, two members of the tobacco MAPK family are activated differentially by various stresses, including wounding and pathogen infection. The primary goal of this lab is to define the in vivo function of these two MAPKs by using a combination of biochemical, molecular and genetic approaches. While the components of a plant MAPK cascade is very much similar to that of yeast and mammals, plant MAPKs adopted different function and regulation during the evolution. For instance, elevation of WIPK activity in pathogen-infected cells requires both post-translational phosphorylation and a preceding gene transcription and de novo synthesis of WIPK protein. In contrast, all yeast and mammalian MAPKs pre-exist in cells and require only phosphorylation activation. Very interestingly, induction of WIPK mRNA and protein also occur systemically and correlates with the establishment of systemic acquired resistance (SAR). By understanding, at molecular and cellular levels, how plants protect themselves under adverse environmental conditions such as a pathogen attack, we could eventually identify suitable targets for genetic engineering of crops with enhanced disease resistance. Mao G, Meng X, Liu Y, Zheng Z, Chen Z, Zhang S. Phosphorylation of a WRKY transcription factor by two pathogen-responsive MAPKs drives phytoalexin biosynthesis in Arabidopsis. Plant Cell 2011;23 (4):1639-1653. 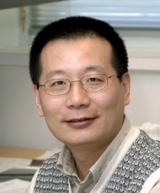 Mao G, Wang R, Guan Y, Liu Y, Zhang S. Sulfurtransferases 1 and 2 play essential roles in embryo and seed development in Arabidopsis thaliana. Journal of Biological Chemistry 2011;286(9):7548-7557. An F, Zhao Q, Ji Y, Li W, Jiang Z, Yu X, Zhang C, Han Y, He W, Liu Y, Zhang S, Ecker JR, Guo H. Ethylene-induced stabilization of ETHYLENE INSENSITIVE3 and EIN3-LIKE1 is mediated by proteasomal degradation of EIN3 binding F-box 1 and 2 that requires EIN2 in Arabidopsis. Plant Cell 2010;22(7):2384-2401. Han L, Li GJ, Yang KY, Mao G, Wang R, Liu Y, Zhang S.Mitogen-activated protein kinase 3 and 6 regulate Botrytis cinerea-induced ethylene production in Arabidopsis. Plant Journal 2010;64(1): 114-127. Huang Z, Kawase-Koga Y, Zhang S, Visvader J, Toth M, Walsh CA, Sun T. Transcription factor Lmo4 defines the shape of functional areas in developing cortices and regulates sensorimotor control. Developmental Biology 2009;327(1):132-142. Beckers GJM, Jaskiewicz M, Liu Y, Underwood WR, He SY, Zhang S, Conrath U. Mitogen-activated protein kinases 3 and 6 are required for full priming of stress responses in Arabidopsis thaliana. Plant Cell 2009;21(3):944-953. Sung KC, Larue CT, Chevalier D, Wang H, Jinn T-L, Zhang S, Walker JC. Regulation of floral organ abscission in Arabidopsis thaliana. Proceedings of the National Academy of Sciences of the United States of America 2008;105(40):15629-15634. Ren D, Liu Y, Yang K-Y, Han L, Mao G, Glazebrook J, Zhang S. A fungal-responsive MAPK cascade regulates phytoalexin biosynthesis in Arabidopsis. Proceedings of the National Academy of Sciences of the United States of America 2008;105(14):5638-5643. Joo S, Liu Y, Lueth A, Zhang S. MAPK phosphorylation-induced stabilization of ACS6 protein is mediated by the non-catalytic C-terminal domain, which also contains the cis-determinant for rapid degradation by the 26S proteasome pathway. Plant Journal 2008;54(1): 129-140. Wang H, Liu Y, Bruffett K, Lee J, Hause G, WAlker JC, Zhang S. Haplo-insufficiency of MPK3 in MPK6 mutant background uncovers a novel function of these two MAPKs in Arabidopsis ovule development. Plant Cell 2008;20(3):602-61. Underwood W, Zhang S, He SY. The Pseudomonas syringae type III effector tyrosine phosphatase HopAO1 suppresses innate immunity in Arabidopsis thaliana. Plant Journal 2007;52(4):658-672. Liu Y, Ren D, Pike S, Pallardy S, Gassmann W, Zhang S. Chloroplast-generated reactive oxygen species are involved in hypersensitive response-like cell death mediated by a mitogen-activated protein kinase cascade. Plant Journal 2007;51(6):941-954. Suarez-Rodriguez MC, Adams-Phillips L, Liu Y, Wang H, Su S-H, Jester PJ, Zhang S, Bent AF, Krysan PJ. MEKK1 is required for flg22-induced MPK4 activation in arabidopsis plants. Plant Physiology 2007;143(2):661-669. Wnag H, Ngwenyama N, Liu Y, Walker JC, Zhang S. Stomatal development and patterning are regulated by environmentally responsive mitogen-activated protein kinases in Arabidopsis. Plant Cell 2007;19(1):63-73. Ren D, Yang KY, Li GJ, Liu Y, Zhang S. Activation of Ntf4, a tobacco mitogen-activated protein kinase, during plant defense response and its involvement in hypersensitive response-like cell death. Plant Physiology 2006;141(4):1482-1493. Hamel LP, Nicole MC, Sritubtim S, Morency MJ, Ellis M, Ehlting J, Beaudoin N, Barbazuk B, Klessig D, Lee J, Martin G, Mundy J, Ohashi Y, Scheel D, Sheen J, Xing T, Zhang S, Seguin A, Ellis BE. Ancient signals: comparative genomics of plant MAPK and MAPKK gene families. Trends in Plant Science 2006;11(4):192-198. Liu Y, Zhang S. Phosphorylation of 1-aminocyclopropane-1-carboxylic acid synthase by MPK6, a stress-responsive mitogen-activated protein kinase, induces ethylene biosynthesis in Arabidopsis. Plant Cell 2004;16(12):3386-3399. Kim CY, Zhang S. Activation of a mitogen-activated protein kinase cascade induces WRKY family of transcription factors and defense genes in tobacco. Plant J. 2004;38(1):142-151. Wan J, Zhang S, Stacey G. Activation of a mitogen-activated protein kinase pathway in Arabidopsis by chitin. Mol. Plant Pathol. 2004;5(2):125-135. Kim C-Y, Liu Y, Thorne ET, Yang H, Fukushige H, Gassmann W, Hildebrand D, Sharp RE, Zhang S. Activation of a stress-responsive mitogen-activated protein kinase cascade induces the biosynthesis of ethylene in plants. Plant Cell 2003;15(11):2707-2718. Liu Y, Jin H, Yang K-Y, Kim C-Y, Baker B, Zhang S. Interaction between two mitogen-activated protein kinases during plant defense signaling. Plant J. 2003;34(2):149-160. Jin H, Kim C-Y, Liu Y, Yang K-Y, Baker B, Zhang S. Function of a mitogen-activated protein kinase pathway in N gene-mediated resistance in tobacco. Plant J. 2003;33(4):719-731. Yang K-Y, Blee KA, Zhang S, Anderson AJ. OxycomTM treatment suppresses Pseudomonas syringae infection and activates a mitogen-activated protein kinase pathway. Physiol. Mol. Plant Pathol. 2002;61:249-256.